‘Half’ of the physical phenomena in a nuclear reactor are related to thermal-hydraulics. The coolant, which can be a liquid or a gas, transports the heat to a heat exchanger or directly to the turbines so that electricity can be produced. At the same time, the core cooling must be sufficient to avoid overheating of the fuel elements. The cooling depends on the flow rate, the shape of the fuel elements, the pressure, the properties of the coolant (e.g. density, heat capacity), to name a few. These depend on the fact whether the reactor runs nominally or operates under emergency conditions. We investigate thermal-hydraulics phenomena in nuclear reactors with the help of experimental facilities and numerical codes. Some examples can be found below. 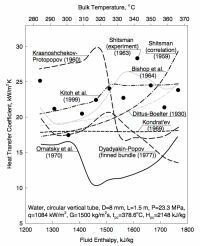 Heat transfer in supercritical fluids is still not well understood. 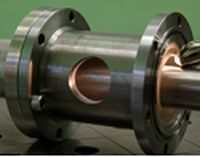 Under certain conditions, heat transfer is diminished by the strongly changing properties of the fluid near the critical point. With the help of numerical codes and experimental techniques (Laser Doppler Anemometry and Particle Image Velocimetry) we try to understand the fundamental of the flow and temperature field, so that practical heat transfer correlations can be developed. Heat transfer in non-unity Prandtl number flows (supercritical fluids, liquid metals) requires reliable turbulence models to obtain accurate results from computational fluid dynamics codes. We participate in this European project by delivering experimental turbulence data on annular flow and three jets of different temperature under supercritical conditions. These data will be used for benchmark purposes. It is important that the coolant in the reactor core mixes well in the radial direction. This avoids hot spots, and thus, fuel failure. 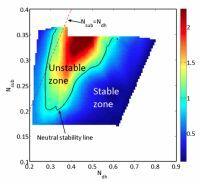 In a reactor bundle, this mixing is enhanced by the presence of large coherent structures. We try to understand the underlying mechanisms that cause these structures by using different techniques such as wiremeshes and Laser Doppler Anemometry. Nuclear reactors are susceptible to instabilities if not designed properly. These instabilities are caused by the coupling between a large number of phenomena taking place in the reactor (thermal-hydraulics as well as the transport of neutrons). In boiling water reactors or a supercritical water reactors, these instabilities are caused by the large density differences in the system. We investigate these instabilities both experimentally with the help of our 10 meters high DeLight facility and with our in-house numerical codes. 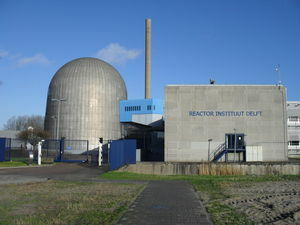 Large-scale reactors always require some external power source to be able to remove the decay-heat in emergency situations. 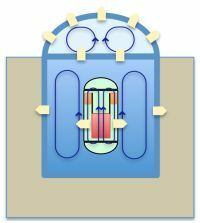 This is where small reactors have an advantage: due to the smaller energy content, decay heat can be removed in a passive way, i.e. without the help of any external mechanical device or power source. Gravity does the job here. We investigate the option of cooling a small-scale supercritical water reactor that is submerged in a large pool of water (similar to NuScale’s design). The advantage of the use of supercritical water is the higher efficiency and the larger driving force due to the large density drop in the reactor core. The enables for a smaller reactor vessel, which is beneficial for the removal of the decay heat. Fully passive way of decay-heat removal from the reactor vessel by three coupled natural-circulation loops. Red: core, orange: heat exchangers (inactive in this situation), green: reactor vessel, dark blue: pool, light blue: dome. The yellow arrows indicate the path the decay-heat follows.